Light and malty. Soft bready malts hit the tongue first leading you into a light and refreshing beer with hints of orange peel and coriander. There is a hint of citrus hops but it never really made itself present. The finish was a little flat with that same sourness I noticed in the smell. Appearance: Pours with perfect clarity and a bright golden wheat color reminiscent of a macro beer. The stark white head , while starting out pretty fluffy thank to the heavy carbonation, quickly settled into an almost invisible film leaving no real lacing to speak of. Smell: Pretty noticeable smell of bread-like doughy malt up front. A slight floral sweetness follows hinting that there may be some hops in there somewhere. There was a funky sourness in the finish. Initial Taste: Light and malty. Soft bready malts hit the tongue first leading you into a light and refreshing beer with hints of orange peel and coriander. There is a hint of citrus hops but it never really made itself present. The finish was a little flat with that same sourness I noticed in the smell. Thoughts:This was a disappointing beer. Blue Point has some really great talent at their brewery. Just take Hoptical Illusions , their flagship IPA, it’s a fantastic beer with a complex hop character and a full bodied flavor. 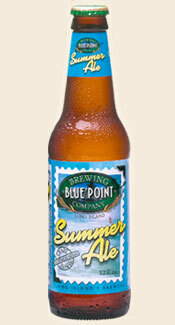 However the same cannot be said about their summer seasonal – Summer Ale. First off, the carbonation is a little over the top. It pours with a huge head that fizzles out too fast leaving a flat beer. If you pour gently the carbonation in the mouth is overwhelming. Secondly, the overall mouth-feel is too thin and watery. Again, this may be on purpose to attract macro beer drinkers but it just didn’t do it for me. So overall this was an underwhelming beer that failed to leave a good impression. That being said I urge you to try it for yourselves and make your own judgement. Cheers! I agree that Blue Point makes some great beers, (I liked the Toasted Lager and surprisingly the Blueberry Ale) its too bad this one seems like a so-so offering at best!